Moscow is the capital of Russia and the country's principal political, economic, financial and transportation center, located on the river Moskva. The urban area constitutes about 1/10 of the Russian population, thus making it the most populous city in Europe. The city is in the Central Federal District located in the west part of the Russian Federation. Historically, its position was central in the Russian homeland. It was the capital of the former Soviet Union, and of Muscovite Russia, the pre-Imperial Russia. It is the site of the famous Kremlin, which serves as the center of the national government. 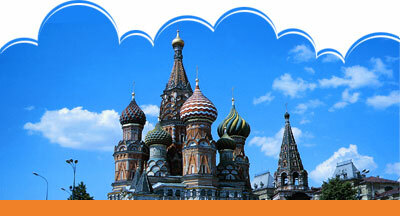 Moscow has always been a popular destination for more adventurous tourists. The better known attractions include the UNESCO World Heritage sites of the Kremlin, Red Square and the Church of the Ascension at Kolomenskoye, all dating from between the 14th and 17th centuries. Other popular attractions include the Zoo, expanded in the 1990s. Moscow is also the western end of the 9 300 km Trans-Siberian railway to Vladivostok. The city presents a unique look in midwinter when the streets are cloaked in powdery snow and the dusky twilight of the continental winter. In winter the locals face the cold with the warm embrace of hospitality. However, as temperatures can often be below -25 °C (-13 °F), early summer or early autumn can offer a much more comfortable and lively visit. Russians like to have fun as much as anyone else, and the very short summers mean that one can find people involved in social events, or roving about, or drinking outside at very late hours. The abundant greenery of Moscow gives the city a semi-tropical feel that pleasantly surprises the visitor accustomed to stereotypes about the Russian cold. The long days will also afford one more time to cover the immense wealth of historical, cultural or simply popular sites in Moscow. 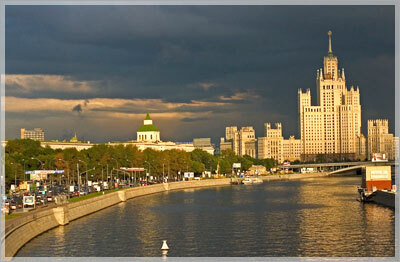 Scenic vantage points include the Sparrow Hills, on the Moscow river to the south-west of the city. Moscow presents many obstacles to the independent foreign tourist without local contacts. While it is not hard to get a visa and enter the country, it is quite common to resort to somewhat expensive, semi-legal procedures to 'register' oneself. The registration process is deliberately bureaucratic, complicated and immensely time-consuming, if one is not staying at a hotel. New medical and work permit requirements have also been introduced by the government, which increases the stress and expenses involved for long-term visitors, who are already required to leave the country every six months and re-register upon entry. While excellent hotels are found all over Moscow, they are usually not for the budget traveller, and not for long-term visitors. Novodevichy Convent is just one of many medieval monuments that dots the cityEveryone is also required to carry their passport for identification and so that the registration can be checked by local militia, who also pose a problem. They are found all over the city but especially in and around Metro stations. Being underpaid, they frequently attempt to supplement their income by stopping people arbitrarily, checking their passports, and demanding bribes to prevent arrest over trivial reasons. Also, with the recent terrorist actions being associated with the darker-skinned Caucasian population, official police racism against all dark-skinned people is rife and the latter are likely to be stopped much more often, sometimes as much as thrice a week. Violent crime, especially but not only directed against foreigners, is also a frequent occurrence in Moscow. However, the average tourist making a brief visit on a package tour is not likely to encounter any of these problems. The educated section of the populace are open-minded and can be very helpful; and expatriates who like making Russian friends find their curiosity and enthusiasm reciprocated and usually have fond memories of their stay, once they understand the system. While customer service is still something new to many Russian vendors, burgeoning Westernization means that high-profile and tourist stores all over Moscow may give you special attention if you are a foreigner. Moscow's climate is described as "continental," with warm summers and cold winters. Typical high temperatures in the warm months of July and August are +30°C (85-90°F); in the winter, temperatures may drop to -15°C (3°F) in January and February. Some prices are considerably higher for the foreign visitor than for locals. A cost of living survey by Mercer Human Resource Consulting puts Moscow in second place after Tokyo, making it the most expensive city in Europe. For natives, small apartments bought or given by the state in the Soviet era, coupled with extremely low utility costs and easily avoidable income tax serve to lower the cost of living greatly. A look at transport prices offers a good illustration. A taxi from Sheremetyevo International Airport will cost the non-Russian speaking traveller upwards of $60; the Russian speaking foreigner will be charged $30-$40. The native Moscow dweller will negotiate the price to $15-20 or will avoid the taxi rank altogether and take a marshrutka (shuttle, shared taxi) to the nearest metro station for about 0.5 dollar.